In the latest episode of Coffee Break Spanish we eavesdrop on a conversation between Rory and Alejandro in which they continue to plan their search for the missing treasure. This episode gives us further opportunities to experience more Argentinian Spanish, and Mark and Carmen are on hand to discuss the grammar and idiomatic expressions contained in the episode. 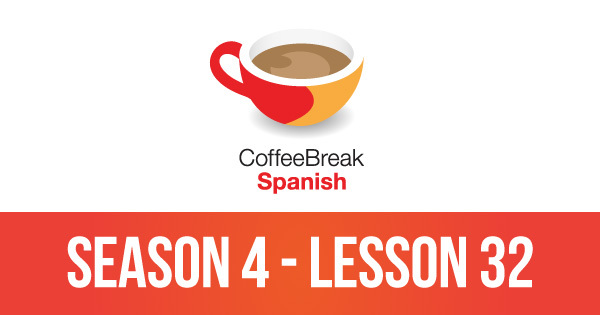 It’s time for a new lesson of Coffee Break Spanish and we join Rory and María again for the latest instalment in the story of their search for the sunken treasure. This lesson continues our advanced series for Spanish learners, and Carmen and Mark are on hand to discuss the complex language points throughout the lesson. In the latest episode of Coffee Break Spanish, Rory, Alejandro and María make a major discovery in the search for the sunken treasure and we join them at this crucial point in the story. As usual, the text is rich in idiomatic expressions and complex grammar points, and you can join Mark and Carmen as they discuss the language used. Rory and María take a trip to the village of Valldemossa and, while enjoying an ice cream, they talk about the possibilities open to them for their future plans which will undoubtedly involve a trip to Argentina where Rory hopes to continue his studies. Of course, Mark and Carmen are on hand to discuss the language used in their conversation. It’s time for the penultimate episode in our series and this week we’re joining Rory as he returns to Scotland ahead of his departure for Argentina with María. Once again the episode is rich in complex language and features a number of interesting idiomatic expressions including hacerse el duro, and much more.